The Bash Amp's failed part was a Thermistor that I believe is used as a startup/inrush current limiter. 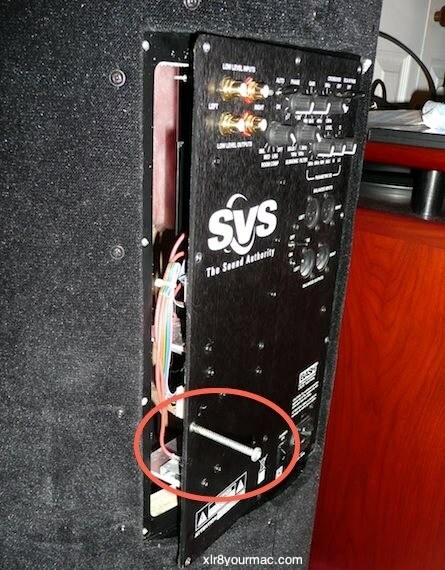 I've seen several SVS 750W Bash amps with similar failures in older PB13/PC13 Ultra subwoofers. Drivers checked OK with a meter and no apparent voice coil or other damage. Ensure Subwoofer and Receiver are OFF, no active input to the Sub. The photos below show TH1 location. It may have cracks, discolored hot spots, etc. 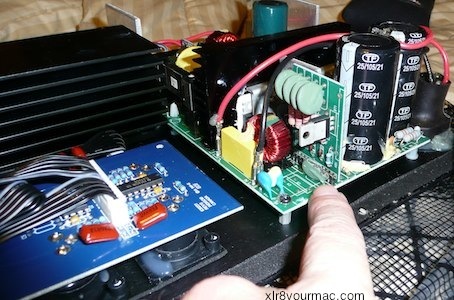 I've seen an amp with cracked thermistor (1/3 missing - see photo below) still work, but with a slight thump on Power-Up. Eventually it will completely fail however, so if any 'thump' is heard at power-up (again with the Auto/On switch in ON position - the "Auto" setting can mask this problem), have the amp checked for damage to TH1. Not sure if EU amps are different, but I've now seen this problem on 3 (USA/120V) SVS 750W Bash amps (used with their earlier PB13/PC13 Ultra Subs). All had what appeared to be the same OEM (Green Disc/unmarked) Thermistor failure. A replacement I've used in US SVS 750W Bash amps is Ametherm Part Number SL15 4R008-03. (IIRC, a post by Ed M. of SVS also listed this as a replacement P/N.) I need one now, but no local electronic parts dealers here have them. They're typically sold mail order for appx $1/ea or less (depending on Qty) plus shipping, for instance at Newark. 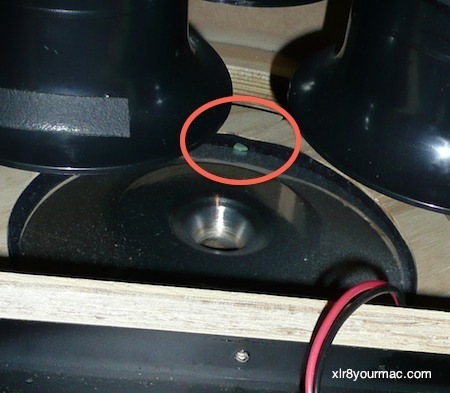 The missing piece of the thermistor from the Bash amp above was found on top of the (downfiring) driver's magnet/motor - luckily it did not fall through the pole vent, which did not have a screen. That's something I wanted to add considering the cylinder's design: a down facing driver, vertical port tubes and open pole vent. Of course the screw doesn't have to be as long as this one. It was just one I had on hand. After seeing several SVS 750W Bash Amp failures like the above over the years, I'd want to inspect the amp before buying any older used PC/PB13 Ultra. IMO, a used Sledge amp Ultra is a better choice even if it costs a bit more. If it originally shipped with the Sledge amp, I'd also be more confident that the driver hasn't been abused as the Sledge amp has much better driver protection (limiter/compressor) than the Bash amp. I liked that the old amp's knobs and switches made it easy to see all settings at a glance (vs the small LCD screen with scrolling menu on the later amps), but I'd pick an Ultra with Sledge amp over the Bash every time. SVS PB/PC Ultras are well engineered products, with a very beefy 13.5" driver (appx 55lbs and a cone that's stitched to the surround), full featured amplifiers with excellent driver protection, from a company with a history of good Customer Support and warranty - even if you're not the original owner. (They replaced a failed 750W Bash amp from a second owner PB13 Ultra that only had a few months of the original 3 year warranty left with a new ($599 list IIRC) 1KW Sledge amp. The only cost was shipping the failed amp back.) They now have a 5 year warranty, 45 day in-home trial, free shipping in CONUS and more - see their customer bill-of-rights for details. 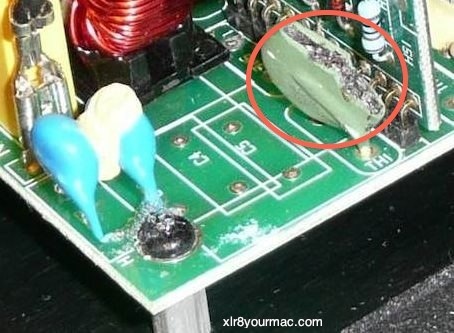 All repair comments are for use by qualified electronics technicans. Use at your own risk. Legal: site terms and conditions of use.